In the past week, we've had a lot of new toys turn up. Amongst them, we've got our GPS receiver, part of the secondary tracking downlink package, and the 434MHz radio unit to go with it. They'll both end up connected to the CCP's serial port (the GPS on the RX line, the radio on the TX line. We just need to work out a common baud rate for the two - by experiment - because it doesn't look as if the LPC1768 supports split baud rates. Not that surprising - after all, they went out of fashion when PRESTEL (using 1200/ baud RX and 75 TX, from the end computer's point of view) lost its market too. Notice anyting? 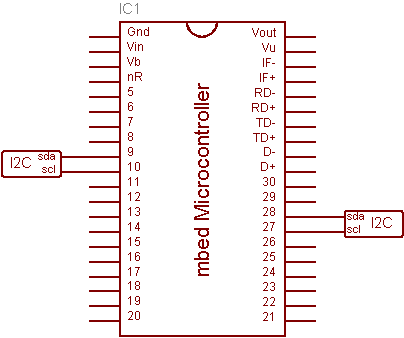 Yep - the same pins are used for serial and I2C - with the exception of the serial port on pins 13,14. 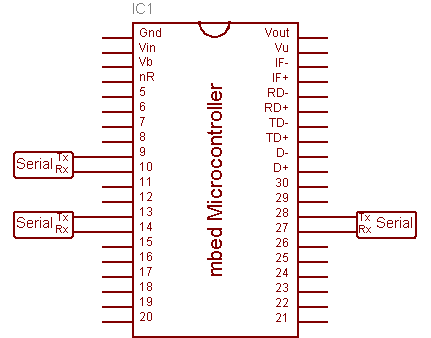 We need both I2C buses, so we only get one spare serial port and that's going to have to service both the GPS, which should be read-only, and the radio, which should be write-only (we're not receiving radio messages).